Each year grade 8 Latin students participate in contests sponsored by Ancient Coins for Education (ACE). 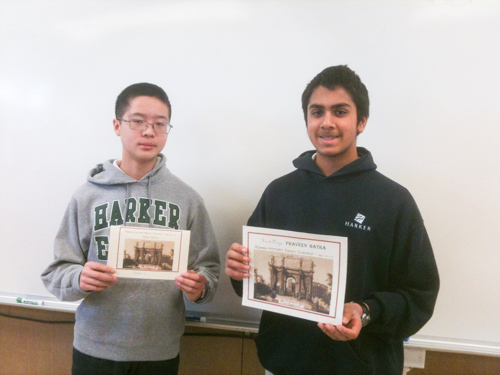 Harker students Edgar Lin and Praveen Batra were named school winners in ACE’s recent essay contest. Batra’s essay on Roman emperor Tiberius went on to win first place in the junior category, according to middle school Latin teacher Lisa Masoni. Both students received ancient Roman coins as prizes. ACE’s goal is to encourage learning about the classical world through the use of primary sources. This is achieved by providing ancient coins for the students to identify and holding essay contests throughout the year. Meanwhile, at the upper school, Harker recently received results from the National Classical Etymology Exam, which students in grade 9 and 10 took late last year. Fourteen Harker students participated in exam, sponsored by the National Junior Classical League, reported upper school Latin teacher John Hawley. “The exam is designed to test a student’s ability to handle both Latin and Greek derivatives and their usage in the English language,” he said. Of the 14 participants, 13 received either gold or silver medals for their prowess. Advanced level students who earned gold medals are Kevin Duraiswamy and Helena Huang, both grade 12, and Sophia Shatas, grade 11. Silver medals went to Tiffany Chu and Sreyas Misra, both grade 12, and Maya Nandakumar, grade 11. Intermediate level students who earned gold medals are Rishabh Chandra, Elisabeth Siegel and Allison Wang, all grade 10, and Venkat Sankar and Arjun Subramaniam, grade 9. Silver medals went to grade 9 students Aditya Dhar and Nikhil Manglik.